For a list of early taxa of birds known only from fossils, see List of fossil birds. For birds that have gone extinct since the year 1500, see List of extinct birds. Prehistoric birds are various taxa of birds that have become extinct before recorded history, or more precisely, before they could be studied alive by ornithologists. They are known from subfossil remains and sometimes folk memory, as in the case of Haast's eagle from New Zealand. 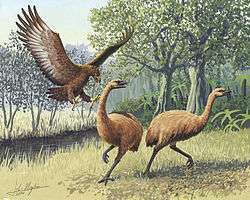 Artist's rendition of a giant Haast's eagle attacking New Zealand moa. Birds (Aves) are generally believed to have evolved from feathered dinosaurs, and there is no real dividing line between birds and dinosaurs except of course that the former survived the Cretaceous–Paleogene extinction event and the latter did not. For the purposes of this article, a "bird" is considered to be any member of the clade Neornithes, that is the bird lineage as exists today. The other lineages of the Aves also became extinct at the end of the Cretaceous. Taxon extinctions taking place before the Late Quaternary happened in the absence of significant human interference. Rather, reasons for extinction are stochastic abiotic events such as bolide impacts, climate changes, mass volcanic eruptions etc. Alternatively, species may have gone extinct due to evolutionary displacement by successor or competitor taxa – it is notable for example that in the early Neogene, seabird biodiversity was much higher than today; this is probably due to competition by the radiation of marine mammals after that time. The relationships of these ancient birds are often hard to determine, as many are known only from very fragmentary remains and due to the complete fossilization precludes analysis of information from DNA, RNA or protein sequencing. This page lists bird taxa that have become extinct before they could be researched by science, but nonetheless survived into (geologically) recent times. Their remains are not or not completely fossilized and therefore may yield organic material for molecular analyses to provide additional clues for resolving their taxonomic affiliations. As these species' extinction coincided with the expansion of Homo sapiens across the globe, in most cases, anthropogenic factors have played a crucial part in their extinction, be it through hunting, introduced predators or habitat alteration. It is notable that a large proportion of the species are from oceanic islands, especially in Polynesia. Bird taxa that evolved on oceanic islands are usually very vulnerable to hunting or predation by rats, cats, dogs or pigs – animals commonly introduced by humans – as they evolved in the absence of mammalian predators and therefore only have rudimentary predator avoidance behavior. Many, especially rails, have additionally become flightless for the same reason and thus presented even easier prey. The taxa in this list became extinct during the Late Quaternary – the Holocene or Late Pleistocene – but before the period of global scientific exploration that started in the late 15th century. More precisely, their extinction was coincident with the expansion of Homo sapiens beyond Africa and Eurasia, i.e. this list basically deals with extinctions between 40000 BC and 1500 AD. They should be classified with the Wikipedia conservation status category "Prehistoric" in their individual accounts. All of these are Neornithes. The ostrich and related ratites. Eastern tokoeka, Apteryx sp. (South Island, New Zealand) – possibly the same as the Ōkārito, Haast or South Island tokoeka. An extinct clade of massive galloansere birds. †Dromornithidae – The Australian mihirungs or "demon ducks"
The group that includes modern ducks and geese. The group that includes modern chickens and quails. Lost megapode or Viti Levu scrubfowl, Megapodius amissus (Viti Levu and possibly Kadavu and Aiwa, Fiji) – may have survived to the early 19th or the 20th century. The group that includes modern rails and cranes. Rallus sp. (known from subfossil remains found on Madeira and Porto Santo Island). Viti Levu gallinule, ?Gallinula sp. (Viti Levu, Fiji) – would also be separated in Pareudiastes if that genus is considered valid, or may be new genus. The group that includes modern boobies and cormorants. The group that includes modern albatrosses, petrels and storm petrels. Huahine ground-dove, Gallicolumba sp. (Huahine, Society Islands) – G. nui? Mangaia ground-dove, Gallicolumba sp. (Mangaia, Cook Islands) – G. nui? Psittaciformes gen. et sp. indet. (Rota, Marianas) – cf. Cacatua/Eclectus? Oceanic eclectus parrot, Eclectus infectus (Tonga, Vanuatu, possibly Fiji) – may have survived to the 18th century or even longer. Psittacidae gen. et sp. indet. (Guam, Marianas) – cf. Trichoglossus/Vini? A subfossil sea eagle (Haliaeetus) from Maui may be a valid species or subspecies; another one listed from the Chatham Islands is in error. Hornbills and relatives. Formerly included in Coraciiformes. Acanthisittidae – New Zealand "wrens"
Olson, Storrs L.; James, Helen F (1991). "Descriptions of Thirty-Two New Species of Birds from the Hawaiian Islands: Part I. Non-Passeriformes". Ornithological Monographs. 45: 1–91. doi:10.2307/40166794. hdl:10088/1745. James, Helen F.; Olson, Storrs L (1991). "Descriptions of Thirty-Two New Species of Birds from the Hawaiian Islands: Part II. Passeriformes". Ornithological Monographs. 46: 1–92. doi:10.2307/40166713. hdl:10088/1745.